Whether you're into rock or rap, country or classical, light jazz or heavy metal, Panasonic Audio products are all designed with one thing in mind: to let you enjoy whatever music you want to hear, wherever you want to go. So if you're looking for uncompromized musical entertainment wherever you are, you can find it right now - in the exciting line of Panasonic audio products.Need a way to get your tunes around without breaking your back? The Panasonic RX-FS470A Slim Style AM/FM stereo radio is a sleek little package of audio dynamite for taking the song in your heart out into the world. Big booming crystalline clear sound emanates from the four-speaker assembly with enhanced bass response for a sound you can feel. Select deck, turn auto-reverse on or off if you're looking for random simplicity. I brought this boombox in 1994.It has a wide stereo frequency.The sound is excellent,...clear and crisp,great clean bass and perfect midrange.It makes am sound like fm.And fm like cds.I only use the xbs bass booster when the bass is weak on some songs.I also had used koss porta jr headphones and memorex normal bias blank recording tapes.It felt like the speakers where separated.This is an outstanding boombox. 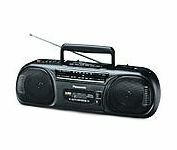 In my opinion,the Panasonic RX-FS470A is the best recording cassette/AM-FM radio/CD input boombox in it's class.I use it often for the casual listening of AM talk/classic rock FM radio and old mix tape cassettes.What it really excells at is recording live music and band practice,as it captures much more bass and midrange detail than any other recording boombox that I have tried.The 3-band graphic EQ and XBS bass extender really helps in this regard,as well.In fact,I like the RX-FS470A so much that I am on my third unit [the first two were stolen].I hope to find another for insurance [hopefully NOS],as I believe that Panasonic no longer has this model in production.I highly recommend the Panasonic RX-FS470A.